Are you a fan of Last Man Standing? BroadwayWorld reports WGN America is hosting a marathon of the Tim Allen TV show this Thanksgiving. The FOX sitcom (formerly ABC) stars Tim Allen as Mike Baxter, a sporting goods store marketing director who lives with his wife and three daughters. The cast also includes Nancy Travis, Amanda Fuller, Molly McCook, Christoph Sanders, Jordan Masterson, and Hector Elizondo. WGN America‘s Last Man Standing marathon begins on November 22nd at 7 p.m. ET/PT. What do you think? Have you seen Last Man Standing? Will you watch the Thanksgiving marathon? 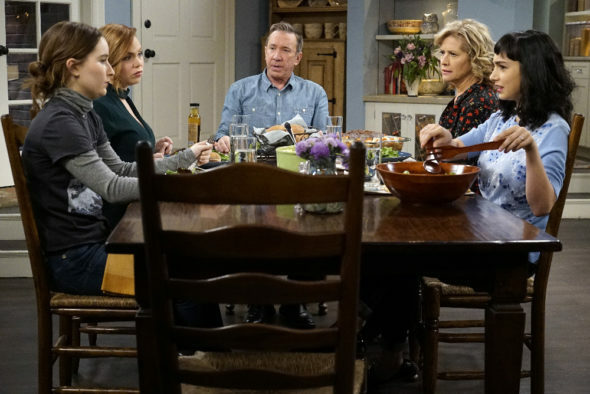 More about: Last Man Standing, Last Man Standing: canceled or renewed?, WGN America TV shows: canceled or renewed? Great show- so glad a network with moxy and independent thought was smart enough to put LMS back on air! Hope you reap big benefits from it. ABC is reaping what it didn’t sow now including the flop of The Conmors. Might not get a chance to watch all of the Thanksgiving Shows, but definately will be watching a bunch. Also so glad they brought it back!